Brazil was discovered in 1500 by Admiral Pedro Alares Cabral, and claimed for Portugal. A Portuguese settlement was established in 1532, and Brazil was proclaimed a Royal Colony in 1549. Brazil remains the only Latin American country with Portuguese as its language, and with Portugal as its major cultural influence, the other countries being mainly of Spanish influence.During the Napoleonic wars, Dom Joao VI moved the Portuguese government to Rio de Janeiro. On his return to Portugal, his son Dom Pedro I declared Brazil's independence on September 7th 1822, and himself as Emperor. Brazil remained an empire until 1889 when it became a federal republic. This became the Federative Republic in 1946. In 1964 there was a military coup which remained as a dictatorship until March 15th 1985 when the civilian government was restored. The constitution which established the Federative Republic was replaced by a new constitution in 1988. Although Brazil's best known city is Rio de Janeiro, it's capital is Brasilia. 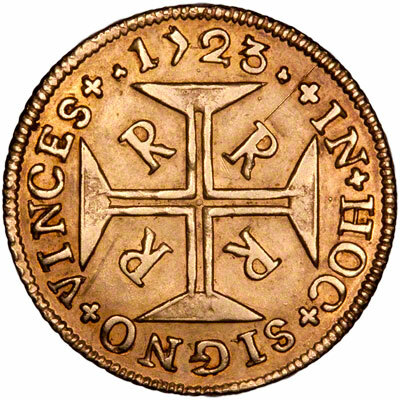 Early Brazilian coins were similar to Portuguese coins, and were denominated in Reis. 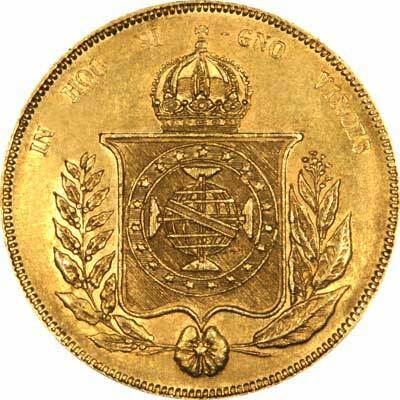 When Portugal adopted the escudo in 1825, Brazil retained the reis, which is still used today. 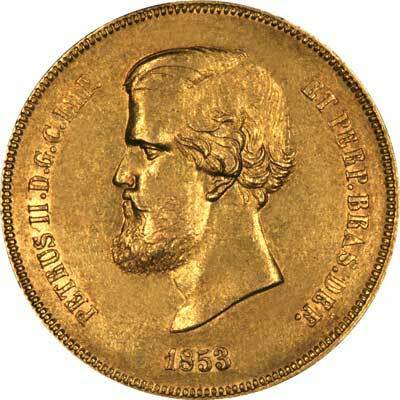 We occasionally have a small selection of Brazilian gold coins in stock. We show the specifications here of the most frequently held coins, followed by a list of coins most recently available. 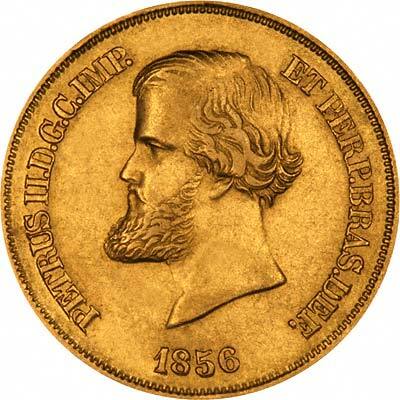 Technical specifications of the most frequently encountered Brazilian gold coins. 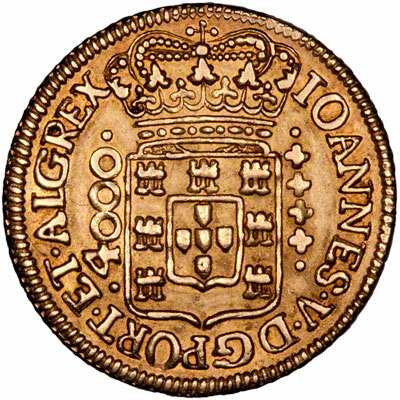 Three different portraits of Pedro (Peter) II were used. Our photograph shows the third bust, which is larger than the second bust. In the first portrait Pedro is wearing a very fancy high collar. 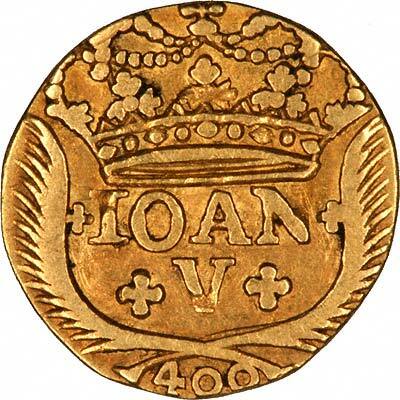 There were also three different reverse designs each corresponding to the change of obverse portrait. 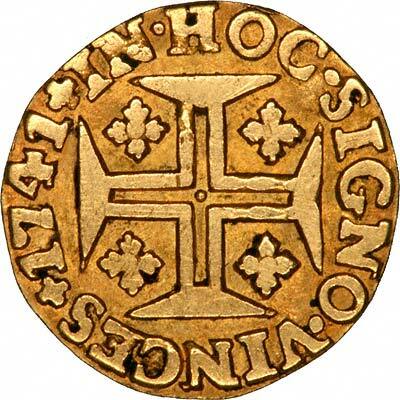 All three feature a crowned flat-topped shield. Beneath this there is a five pointed star superimposed on a flower from which emanates a laurel branch on the left, and a different plant on the right, possibly an Ipê-Amarelo - (Tecoma chrysostricha), which is the national flower of Brazil. 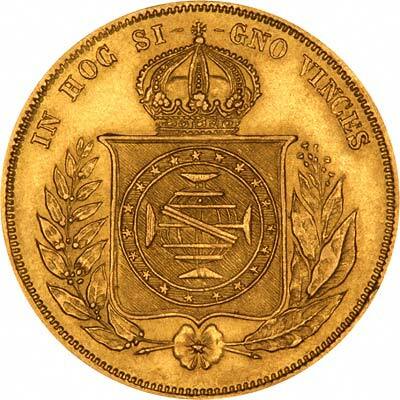 The Latin legend (inscription) IN HOC SI GNO VINCES means "in this matter you will triumph". Although we have spelt the countries name as Brazil, it seems that the Brazilians spell it Brasil.